Also, if you haven’t read my Amazon Kindle Guide, you’ll need to. This guide won’t make much sense without it. Please follow the formatting suggestions as it is going to make formatting for the Nook a breeze. And I mean that. A total breeze. If you found formatting and posting to Amazon painless, this is going to be like sipping coffee that is just a little too hot. Yeah, really. Okay, if you have your document formatted for Kindle, you are 90% of the way there. If you don’t, read the formatting section here but stop before you get to the conversion process. You just need to end up with a Word document (.doc – NOT .docx, the new Word format). I’ve read that people have problems using some of the other word processing programs and saving to .doc but I didn’t experience that the first time around (I used Open Office for Bob Moore: No Hero). If you have Microsoft Word, you should use it (even if you generally don’t). It’ll make your life easier. Now, one of the biggest changes (and if you have a formatted Kindle manuscript, you’ll need to make this change) is that instead of page breaks, you’ll need section breaks. What’s the difference? The conversion process for Nook doesn’t like page breaks and, from what I can tell, section breaks are hit or miss for Mobipocket eBook Creator for the Kindle. I might be wrong, though, so feel free to test it out. For me, I had to less than 30 changes so it really wasn’t a big deal. Make sure you make these changes in a new document (I’ve labeled each one based on where it was going – Kindle, Nook, Smashwords, iBooks along with the date of the last modification). Theoretically, if section breaks work for both Nook and Kindle, you could just use them for both and have a single document for both Amazon and Barnes & Noble. But I wouldn’t recommend that. The first thing I did after changing all the page breaks to section breaks was to go back and make sure my links were all pointing to the right place. For the link to my first book, I linked Kindle users to the Amazon link. For Nook readers, I wouldn’t want to do that. Instead, I linked it up to the Barnes & Noble version. It is at this point that I should be talking about conversion. I’m not. You’ll see why. Once you have your account set up and verified, you can upload your book. So now I’m going to talk about the conversion process into the obscure, used-only-by-B&N format, right? Wrong. Word .doc. That’s it. If you have used my Kindle_formatting_Template and changed your page breaks to section breaks, you should have no problems. Like Amazon, they have a preview function but I didn’t trust it. Luckily, they also allow you to download the converted version. 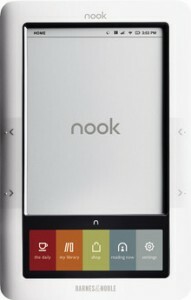 You can then use one of the many Nook apps (there is one for PC, Mac, iDevice, and Android) to test it out. Once you are happy, you put it on sale and wait. Takes anywhere from 24 to 72 hours according to Barnes & Noble to show up in their store though I think it was less than a day for me. And that is it. No expensive ISBNs, no third-party conversion programs – just upload your Word .doc and you’re done. In theory you could go from clicking on the PubIt! link above to selling a book in just a couple of days. It is very easy (easier even than Amazon). The problem, of course, is audience. Nook doesn’t have nearly the reach of Amazon so it still makes sense to go the Kindle route first. I will say – now that I’ve done them both, I can’t understand why the other outlets are so difficult. Barnes & Noble really got this right. Given how easy this process is, I can’t see why anyone would need to use a third-party (like Smashwords) to submit their books. If this guide has been helpful, please consider supporting me by buying one of my books. Tom…thank you so much for your informative wesite. I am a wet-behind-the-ears newbie to the publishing world, though I have kept journals and written about various episodes of my life, I’ve only had one offer to publish years ago. My question is: If one can publish on both Amazon & B&N, does Amazon have a fit and fall down in it if the ISBN is issued by A & then used to publish on B&N? Operating on the theory that only unasked questions are dumb, I hereby submit this one, while shielding my old white head from blowback. Again, thanks so much for the time & effort you have expended on this. My understanding is that you need an ISBN number for each book type. That means one for the hardcover, another for the paperback, a third for the ebook, etc. Like paper copies, the ebook ISBN should not have to change from vendor to vendor. That said, neither Amazon nor B&N require an ISBN. They’ll issue you, for free, one of their own numbers.